WHILE IT’S STILL JUST PAPER. 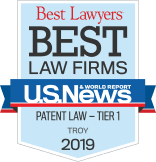 We are Michigan’s oldest intellectual property law firm and the foremost thought leaders in the changing world of IP law. Learn how Reising Ethington can help you identify which of your assets can be protected—and all the best ways to leverage them. At the Intersection of U.S. Patent Laws and Autonomous Vehicles: A Look at Patent Eligibility and Claim Indefiniteness.